The revised Skoda Fabia will cost from £9330 and the Roomster will start at £11,260 when they go on sale on 1 April in the UK. Both facelifted models were revealed at the Geneva motor show last week and come with new headlights and front bumpers to give them the same family look as the Superb and revised Octavia. 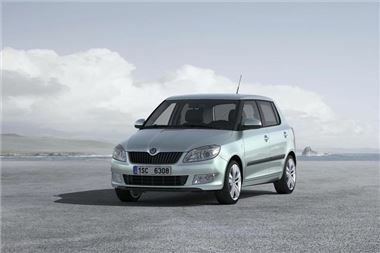 There are also new engines for the Fabia and Roomster, with four petrol and two turbodiesel motors on offer. The new engine is a 1.2-litre turbo petrol with 105bhp that comes with a seven-speed double-clutch gearbox that does away with the clutch pedal. Skoda says this engine delivers 53.3mpg combined economy and 124g/km carbon dioxide emissions. This is a reduction in CO2 of 56g/km compared to the previous 105bhp 1.6 petrol engine and Tiptronic automatic gearbox that the 1.2 replaces. The 1.2 will also be available in 85bhp form, and both 1.2 engines come as standard with a five-speed manual gearbox. Skoda's 1.6-litre turbodiesel engine emits 109g/km of carbon dioxide in both 90- and 105bhp guises, which will appeal to company drivers who can write down the full value of the car in its first year. The usual trim levels persist with the Fabia and Roomster, and the Fabia continues to be offered as an Estate with prices starting at £10,425. The Fabia Scout costs from £12,695 and £13,890 for the Roomster Scout.